The Ranthambhore National Park is named after the 10th century Ranthambhore fort, which covers the entire top of a hill at the heart of the Park. The Ranthambhore fort, in turn, is said to have got its name from two adjoining hills - Rann and Thambhore. It lies on the Thambhore hill, overlooking the Rann and offers some breathtaking views of the Park. The walls of the fort are about 7 kilometers in length and include an area of nearly 4 square kilometers. All around the fort, one can see many old ruins, including palaces, temples, cenotaphs, step-wells and houses. The Ranthambore fort is surrounded by massive stonewalls which are strengthened by towers and bastions. The stone for the masonry was mined from inside the Fort and the mines were later turned into ponds for water storage. The main approach to the Fort lies through a narrow valley, which had four fortified gateways. Of these, only the first gate - Misradhara gate, is still standing. There are many ruined buildings inside the Fort, with Hammir's Court, Badal Mahal, Dhula Mahal and Phansi Ghar being the most prominent of them. The Fort also has many cenotaphs, temples and gates. The Ganesh Temple, which lies very close to the main entry gate to the Fort, attracts a steady flow of pilgrims, mainly from the rural hinterland. During the annual Ganesh festival, tens of thousands of pilgrims visit the temple, from all over the country. Most of the visitors to the Fort tend to stay in the Western part of the Fort. Very few visitors go to the eastern part of the fort, which is nearly wild. A small perennial stream called Gupt Ganga flows in this part of the Fort. Here one can see a large number of birds, Langurs, the odd small cat and sometimes, even leopards. The fort is one of the best places to look for the very rare and elusive Fishing cat. 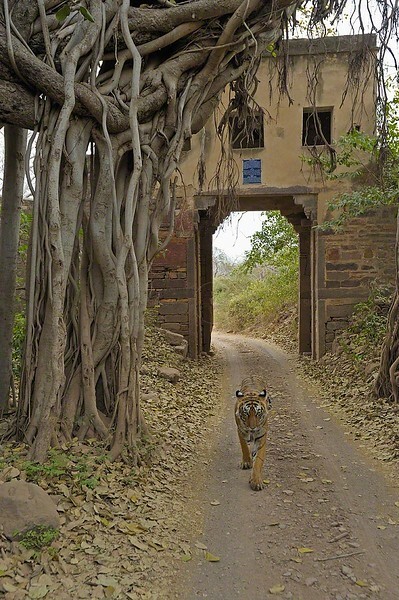 The fort is a must see for all visitors to Ranthambhore. A good day to visit the fort is Wednesday, the day of the Lord Ganesh, when a lot of local people visit the Ganesh temple dressed in their best finery.